The command "UNION" is the perfect way to join two tables with the same data context. Whether they have or do not have the same fields, you need to classify the data. Look at this selected query. After the UNION, it filters by the field name Person that begins with Maria. All fields must be at the same position and the same data type, you can make all kinds of selects, joins, where etc. The "UNION ALL" command is better than UNION if you want to select all rows. If they are the same**, this is not the case. In this sample, you can make it a View. You must be careful of the position of the fields and the type, and you can use cast too. This selection is just an example. The SQL UNION ALL operator is used to combine the result sets of 2 or more SELECT statements. It does not remove duplicate rows between the various SELECT statements (all rows are returned). If you’re a developer, irrespective of the platform, you have to work with databases. Creating SQL statements for tables is quite often a monotonous job and it gets hectic especially when dealing with gigantic tables that have hundreds of columns. Writing SQL statements manually every time becomes a tiresome process. Before explaining the script, I want to share the reason to write this script and how it is helping my peers. We have code standard on the database side. Below points are standards. Every parameter should be nullable in a stored procedure. I am developing an application which is related to machines using .NET and SQL Server. The database design consists of some master tables and transactional tables. All the transactional table has more than 30 columns. All the queries should specify the column instead of using the start(*). It consumes more time and is a boring task. So, I plan to write the script to is cut down on the time it takes and boring repeated work. We cannot automate the logic, but we can automate the repeated task. Then I write the below script which really cuts down on all of our above pain points. Step 1 - Create the stored procedure using the above code or attached code. Step 2 - Execute the stored procedure and pass your table name as a parameter. Once you execute the Stored Procedure as mentioned above, you get all the SQL statements as shown here. You could easily use the generated SQL statements elsewhere. You get all basic SQL statements like Select, Insert, Update & Delete. In this blog, we will discuss the query formatting using FOR JSON clause with AUTO mode option. When AUTO option is used, the format of JSON is determined automatically on the basis of the number of columns present in the SELECT statement list. A FROM clause is necessary inquery with FOR JSON AUTO option. When you join tables, columns present in the first table are used as properties of the root object in JSON array while columns present in the second table will be automatically formatted as a nested object within the root object. Let’s execute the below query and see the JSON output. After executing the above query, we get the output in this format. Brackets [ ] represents JSON array in output. Here, in the output, we can see that table Sales.SalesTerritory is automatically formatted as a nested object under parent object. So we have generated a formatted query output using JSON clause. I will continue with other ways of formatted output using JSON clause in my next blogs. In this article, I am going to tell about the dropping of indexes in View in SQL Server. Views are virtual tables in which data from one or more tables gives the result set as our SQL table does with rows and columns. A View doesn’t store the data permanently in the database and at the time of execution, only its result set gets determined. When a View contains a large amount of rows and has complex logic in it then we can create an index on a View to improve the query performance. A View consists of a Unique Clustered Index and it is stored in the database as the clustered index does. Now, let’s run a few scenarios to check when Clustered index which is created on a View gets dropped automatically. First, I will create a table on which I will run those scenarios. Now, I will create a View which will use this Customer table. Here in the definition of View, I have used WITH SCHEMABINDING which is necessary for creating an index on a View. This option simulates that we cannot delete any of the base table used in the View and in order to make any changes, first, we need to drop or alter the View. Also, all the table references in a View should have two part naming convention (schemaname.tablename) as we have in vw_Customer view (dbo.Customer). Now, I will create an index on our View. Error returned: Cannot create index on view 'vw_customer'. It does not have a unique clustered index. On Views, the first index must be a unique clustered index, so this will throw the error. So, the first index on View should be UNIQUE CLUSTERD INDEX, else it will throw an error. Now, our Indexed View is created having a clustered index on it. Now, I want to alter my View and add one more column GETDATE() as CurrentDate in the View definition and alter the View. Now, alter the View after Scenario 2. Now, as I have altered the View, I want to create another index on column CustomerName which will be a NonClustered index. Again, I get an error: Cannot create index on view 'vw_customer'. It does not have a unique clustered index. As we have already created Unique Clustered Index on View, still it gives an error. The interesting thing is that after updating the View, the index that was created in Scenario 2 is dropped and the code will throw the same error as in Scenario 1. "ALTER VIEW can be applied to indexed views; however, ALTER VIEW unconditionally drops all indexes on the view." Then I did some workaround and used the Windows function indirectly using a CTE (Common Table Expression) for this. I will show you step by step how I accomplished this using CTE. When I ran this SQL code I didn’t get any error and ID column values to get updated with unique values. In this blog, I will show you how to write multiple SQL Statements in one procedure. Instead of writing separate procedures for Select, Insert, Delete and Update operations into the table, I am going to show you how to combine all operations into one single Stored Procedure. We want to write a procedure for this table for Select, Insert, Delete and Update records. Instead of writing separate a stored procedure for each operation we are going to write only one stored procedure to perform Select, Insert, Delete and Update records. Are you wondering how to accomplish this? It is simple -- just add a parameter to the stored procedure. Depending on this parameter we are going to execute the appropriate operations. In the above example, based on the @Reqtype column the corresponding sql command will execute. For example, if the @Reqtype is select then select statement will execute. If the @Reqtype is inserted then Insert statement will execute. In this blog, we have learned how to write multiple SQL operations into a single SQL procedure. In this post, we will be discussing an alternative to using a SQL “IN” condition, where many values need to be parsed to the SQL query through the use of a User Defined Data Type to get exact records back based on a list of ID's. There will probably be a very small number of cases where additional steps (as detailed in this post) will need to be carried out. Afterall, SQL Server has a very large limit on the number of values the “IN” condition can handle, based on the length of instruction (max 65k). However, based on personal experience where there is a bigger need for dealing with large volumes of data, investing extra time in database architecture is always good. First introduced in SQL Server 2008, User Defined Data Types defines a way to storing temporary data in a structure similar to a table. The User Defined Data Type can be populated through a Table-Valued parameter within a stored procedure. This will be the key to what we will be using in dealing with many values for our alternative to using the IN condition. I encountered a scenario that required a flexible way to get back a number of specific records from my database when I received a list of product ID’s from an external API for cross-referencing. Normally, I would just grab all the ID’s and parse them directly into the IN condition. It was an unknown as to how many ID’s would received from the external API and a different approach needed to be considered to ensure the application would be scalable. The first thing we need to do is to create a User Defined Data Type that will allow us to pass the list of our product ID’s in a table structure. The structure itself is very simple and contains just one column called ProductID. Next we create a stored procedure called “spGetAllProductsByIDs” that will contain a parameter based on the data type we created above. In this case, the parameter is @ProductsTVP. Note that when using a variable based on a data type in a stored procedure, it must be declared as READONLY. The stored procedure is simply getting back all products from CMS_Products table based on a values stored in @ProductsTVP parameter through a join. Now all that needs to be done is to use this stored procedure in code. A method called GetProductsBySearchTerm() gets a list of product ID’s based on search terms from a call to the SearchApiHelper class, which then transforms this output to the “prodIdsTable" DataTable structure similar to our Type_ApiProductIDs data type. 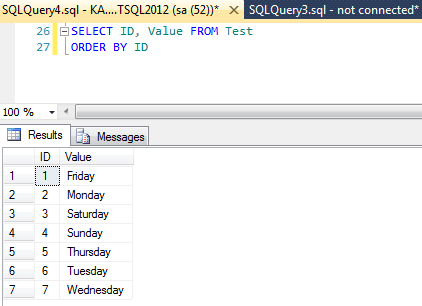 To use this DataTable with our stored procedure, we’ll be using a SqlDbType.Structured SQL parameter. In addition to a DataTable, a IEnumerable<SqlDataRecord> and DbDataReader can be used in conjunction with the SqlDbType.Structured parameter. List<int> searchProductIds = SearchApiHelper.GetResults(searchTerm); // Get list of product ID's. // Create a Data Table in the same structure to User Data-Type. // Populate "prodIdsTable" datatable with ID's from SearchApiHelper.